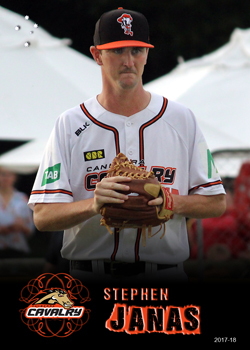 Janas is an American import who played with the Canberra Cavalry during the 2017-18 ABL season. This sin't the best picture of Janas, but unfortunately he was released by the Cavalry mid-season and I had yet to get many photos of him, so this is the best of a bad bunch. Janas had spent four years (2013-2016) in the Atlanta Brave's farm system, reaching AAA level before being released. In 2017 he play with the York Revolution in the independent Atlanta League.